It took a tremendous amount of effort and evil to develop the few abandoned Polish barracks in the small town of Oswiecim, Poland into one of the worst hellholes of accumulated misery that mankind has ever devised. In post-war testimony at the Nuremburg Trials, Supreme SS Commandant of Auschwitz-Birkinau, Rudolph Hoess, proudly told the world he ran the "greatest human destruction machine of all time". Those who think this never happened are in massive denial. An estimated 1.1 million people of all ages had their lives come to a premature and painful end here- more than at any other Nazi camp. Most of those who somehow survived suffered greatly as well. In the winter of 1944-45 many thousands died in a long, forced march away from the camp to avoid liberation by Soviet troops. Over 500 of the 7600 prisoners left behind in the camp died after liberation because they were too far gone to save. 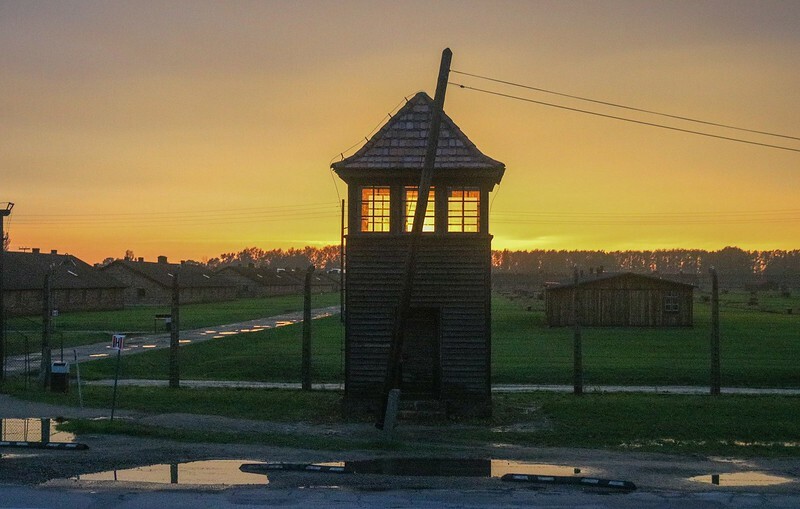 The complex consisted originally of Auschwitz concentration camp, and later Birkinau Death Camp was added where genocide was perfected in mass. To help tell the story I have posted some photos of large images on display at the camp. Most photos/records were destroyed by the Nazis in the retreat. Nothing like this must ever happen again. I feel privileged and honored to have seen this memorial site in a time when some of its survivors are still alive and breathing. And remembering. Remembering a level of agony only those who were there could ever comprehend. Birkinau perimeter guard shack. No pretenses were made here. This was not a prison camp-it was a death plant. By conservative estimates the killing reached 6000 people per day in 1944-45.